Medium French Fry Please? Or maybe not. After my previous post of mentioning how much I love french fries and then the one before that mentioning what you should look for when eating something, I figured that’d I kind of combine the two. I complied information taken from these restaurants nutritional information, and it kind of smacked me in my face! Why does it have to be, that everything that tastes so good is so bad for you? While I mourn over how bad all of this is for you, I’ll eat some homemade french fries. When I mentioned that it was best to eat things that have the least amount of different between calories and calories of fat, who ever would’ve thought that it meant that McDonald’s had the best choice for this when it came to Fast Food Medium French Fries! I surely would’ve thought that Wendy’s “Natural Cut, Sea Salted” fries would beat McDonald’s. It seems that McDonald’s wins in anything pertaining to fast food french fries. Great taste, and least amount of sodium, fat, and calories. Calories, Carbs, Fat…what do I pay attention to? Every since I become conscious of my weight and my appearance I have worried about what it is that I am putting into my body. Every time I pick up something at the store, or am about to eat something I’ll look up the nutrition information. That little white rectangle perplexes me beyond many degrees. I never know what to look at! Should you be counting calories? Carbs? Total Fat? What should you look for on the nutrition label when deciding what to eat? I’ve decided that it was about time that I did some research and discover what it is that we should all be looking for and what it all means. I found a great article written by the people at Quaker Oats about how to correctly dissect a nutrition label. Also the FDA has a very descriptive article as well! Last but not least, this article is very informative as well. I have always looked at just the Calories section and completely disregarded this second section. 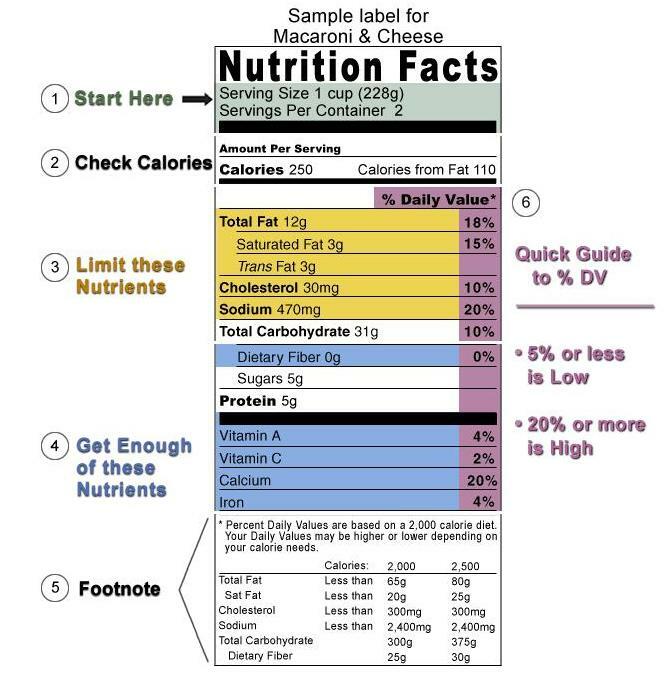 When looking at a nutrition label you should try to find food that has a Calories From Fat number that is way less than the Total Calories; this means that it is low in fat and isn’t primarily made up of fat! No more than 30% of your food intake of the day should be derived from fat. Most fats are high in calories and should be consumed in moderation. Eating too much fat, saturated fat, trans fat (found in vegetable shortenings, some margarines, crackers, candies, cookies, snack foods, fried foods, baked goods), cholesterol, or sodium may increase your risk of certain chronic diseases, like heart disease, some cancers, or high blood pressure (it is recommended that you keep these as low as possible). On the other hand you need to eat plenty Vitamin A, Vitamin C, Calcium, and Iron. Most American’s do not eat enough of these. Use a nutrition label to your advantage and increase the good things that your body needs and reduce the bad things it doesn’t need! Unhealthy carbs (or bad carbs) are foods such as white flour, refined sugar and white rice that have been stripped of all bran, fiber and nutrients. Unhealthy carbs digest quickly and cause spikes in blood sugar levels and energy. So when looking at the Carb count on a nutrition label, think about where those carbs are coming from! 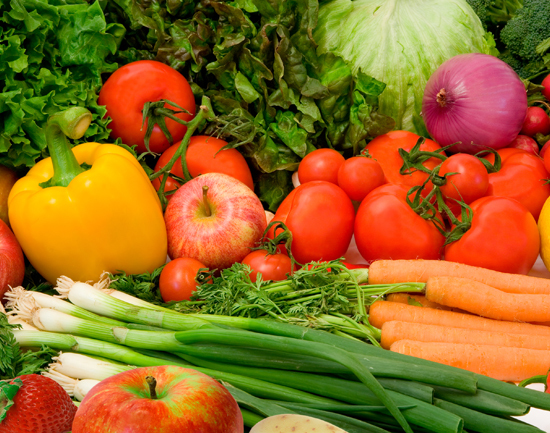 Usually if it has a carb count, it won’t be a good carb since good carbs come from fresh veggies and fruits! My previous blog was entitled “Choco-holic” and I can tell you, I am the reason the made-up word was created! I used to eat Chocolate Chip poptarts for breakfast every morning! Once I got into college, and my classes were longer and fewer breaks in between I realized the effects of eating this kind of breakfast in the mornings! Everyone needs protein in their diet, especially in the morning. Protein gives us the energy to get up and go! It is very important for your growth (maybe that’s why I’m so short, I didn’t have enough protein as a child). When it comes down to it, just try your best to eat the most healthiest foods possible! When making your food or buying food, the saying “the more color the better” is always good to follow! Pay attention to all parts of the nutrition label, not just one section of it. All of the information is there for a reason. Don’t go overboard and cut all the good, tasty foods out of your life! Everything is okay in moderation! Remember that. Whenever you are in doubt about something, do some research! The internet is a great tool, so use it to your advantage! Tip: When going out to eat with friends and your afraid that you’ll eat too much, have an apple or healthy snack before you go out so you won’t be as hungry! Second Tip: Shop the perimeter of the grocery store! That’s where the fresh meats and fresh veggies are.